Ongoing stewardship and monitoring of Wild Rice in SW Michigan has been a focus of Nottawaseppi Huron Band of the Potwatomi (NHBP) activities for 10 years. Recent challenges have included high water events, virus infestation, and above average seasonal temperatures. These and recent successes will be reviewed and discussed. Future activities and a review of various monitoring technology with time for discussion is planned. 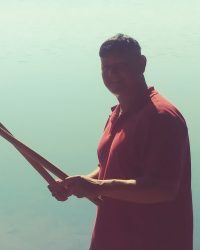 Nathaniel “Nat” Spurr is a Tribal Member of the Nottawaseppi Huron Band of the Potawatomi (NHBP), as well as an employee of the NHBP Environmental Department and a member of the Tribe’s Monomen Ogemuk (Wild Rice Leadership Team). He was first introduced to the process of wild rice harvesting/production as a young boy in Northern Wisconsin, where his maternal grandfather had been a full-blooded Indian and Tribal citizen of the Bad River Band of Lake Superior Chippewa. His grandmother was a full-blooded member of NHBP, born and raised on the Pine Creek Indian Reservation (at the time, fluent in only Bodewadmi). Nat has been involved with the NHBP Environmental Department’s Mnomen project for the past three seasons and besides being a lifelong NHBP tribal member, is a resident of the Pine Creek Indian Reservation, currently living on the Pine Creek, where wild rice planting/seeding is currently underway, and previously resided on the Nottawa Creek, where a wild rice bed grows.